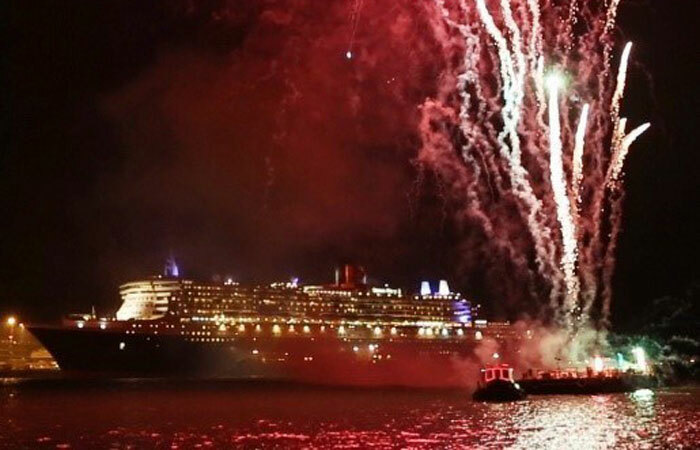 Britain’s Cunard Line is now in full celebration mode for its 175th Anniversary and already the cruise line has released a ton of special videos and released a load of fireworks! Flagship Queen Mary 2 and sister ship Queen Elizabeth took centre stage in Southampton on Saturday as the two Queens embarked on their 2015 World Voyages. Joining guests on board were acclaimed British actress,Celia Imrie (aboard Queen Mary 2), and former chief news correspondent for the BBC, Kate Adie (aboardQueen Elizabeth), as part of Cunard’s acclaimed Insights speaker programme, featuring high-calibre presenters throughout the year. Further leading lights, including statesmen, authors, actresses, poets and politicians, will share their knowledge, stories and experiences with passengers on board Cunard’s ships during this anniversary year. The 175th anniversary will be celebrated across all three Cunard ships during the year, with Gala dinners with souvenir menus on cruises of more than four nights, “Black, Red and Gold” themed Balls in the Queens Room aboard each ship, themed commemorative drinks, themed entertainment, specially created 175th merchandise, specially stamped postal mail sent from onboard and In cabin stationery themed on the anniversary. Highlights of Cunard’s 175th year will include the gathering of Queen Mary 2, Queen Elizabeth and Queen Victoria in their home port of Southampton on 3 May for a spectacular sailaway of the three Queens. And up to one million spectators are expected to gather in the company’s spiritual home of Liverpool for the “Three Queens, One Magnificent City” three-day event 24-26 May. This will culminate on 25 May when the Cunard fleet, made up of the three largest ships ever to appear in formation on the Mersey, will perform a series of carefully choreographed maneuvers within sight of the Three Graces on Pier Head waterfront, including the iconic Cunard Building which was the company’s headquarters for nearly 50 years. Cunard will also re-create the transatlantic voyage that marked the start of the company’s 175 years of operation. Queen Mary 2’s “175th Anniversary Crossing” (Southampton to New York 2-14 July 2015 M511D) will sail into Liverpool on 4 July and depart the same day – exactly 175 years since Cunard’s ship Britannia made her maiden crossing from the port, heading for Halifax and Boston. One of Cunard’s most famous ships, Lusitania, will also be respectfully saluted by Queen Victoria during a special Lusitania remembered sailing (3-10 May 2015, V510) as the ship sails into Cobh, exactly 100 years since Lusitania was torpedoed off the coast of Ireland on 7 May 1915. A series of commemorative events have been organised in the town which passengers are invited to attend, while on board, expert historian Eric Sauderwill display on board a special collection of Lusitania memorabilia including china, silver, brochures, postcards and souvenirs that will help tell the story of Cunard’s former flagship. A few places remain on this historic sailing, with Cunard fares from $1,559 per person for inside accommodation. the cruise line also released a new animation timeline which you can watch right here. Cunard Line will release more details on upcoming Anniversary event so keep an eye out.